This post follows up Part 1 which laid down much of the financial information required to understand what amalgamation might mean for the municipalities of West Parry Sound. Here is a link to the first post. The intent of this second post is to add a little more colour to the numbers along with some general observations and commentary. In response to a few comments to the first post I want to categorically state that it is not my intention to make a case for, or against, amalgamation. What I am hoping to do is provide a framework for better understanding the implications of amalgamation. It’s bit like a pre-Brexit analysis. In the case of what was to become called Brexit I believe too many people voted without the benefit of any real analysis or understanding of the implications for and against. Their vote was mostly based on whether they held a ‘screw the EU’ or an ‘EU is our future’ mindset based on their personal experience, advertising and ‘gut feelings’. I am in a situation where I understand the Town of Parry Sound budget reasonably well and the underlying expenses. I am hard pressed to find fault in the budget decisions that Council has made that underlie the current Parry Sound tax rates. The cost is what it is, and I am able to afford my property taxes. Any reduction in taxes through amalgamation would not have an impact on my quality of life. I do understand that this is not the case for many others in Parry Sound or one of the other communities. Okay, let’s look at the numbers and perhaps tease out some meaning. In the previous post I laid out the more important tax rates for the municipalities. I won’t go into details about the relative tax levels of the municipalities. The Town of Parry Sound has the highest overall tax rates by far, with Seguin and Archipelago having the lowest. Perhaps more relevant is understanding the property class tax rates set by individual municipalities. Table 1 below is an expanded version of Table 1 from the first post (Part 1). It provides a summary of the various municipal property and educational tax rates and the premium charged to the Commercial and Industrial classes relative to the Residential Rate. For example, in the case of Carling the Industrial Property Tax Rate is 2.6 times that of the Residential Property Tax Rate. Note: Residential Tax Rate is assigned a value of 1 for each of the municipalities. Comparisons are only valid within a single municipality and tax rate class. I am not familiar with the details of what limitations municipalities have in assigning taxation rates by class. I recall discussions at Parry Sound Council where it was mentioned that there were provincial guidelines on how much the various property class rates could be adjusted. 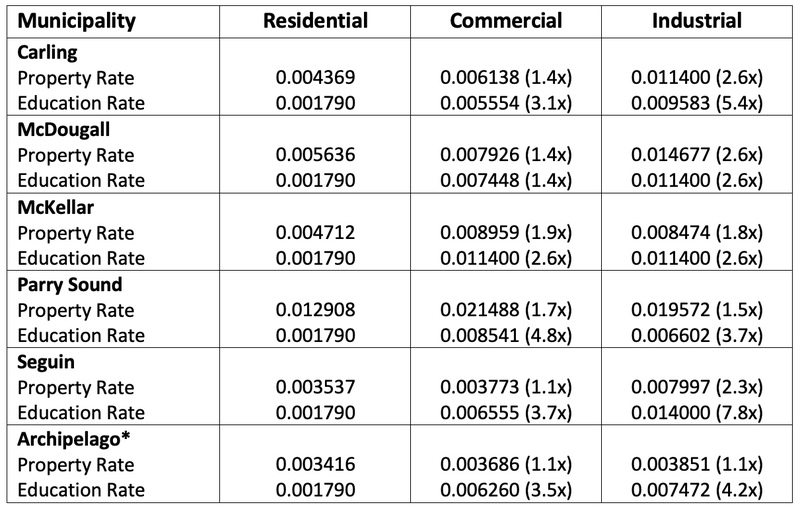 Nonetheless, it seems that all the municipalities consistently place higher tax rates, Property and Education, on Commercial (i.e., Walmart, Fireplace & Leisure Centre…) and Industrial (i.e., Connor industries, Shaw-Almex …) properties in comparison with Residential properties. The premiums for Commercial Property Tax Rates vary from a low of 1.1x in Seguin and Archipelago to a high of 1.9x in McKellar versus the Residential Rate in that municipality. An even larger premium is seen with Education Rates which range from a low of 1.4x in McDougall to a high of 4.8x in Parry Sound. Combined, the Property and Education Rate premiums for the Commercial Property tax rates vary from a low of 1.9x in Carling, Seguin and Archipelago to a high of 3.1x in McKellar. The premiums for Industrial tax rates relative to the Residential Rates vary from a low of 1.1x in Archipelago to a high of 2.6x in Carling and McDougall. The Education Tax Rates premiums for Industrial Properties range from a low of 3.7x in Parry Sound to a high of 7.8x in Seguin. The combined rate premiums range from a low of 1.8x in Parry Sound to a high of 4.1x in Seguin. Carling and McDougall – tax rates seem to be much more favourable for Commercial rather than Industrial properties. Is this an intentional attempt to encourage Industrial businesses to look to other area municipalities to establish their businesses? It’s not clear to me how properties in the industrial park in Carling are taxed. They may well enjoy some tax benefits or reduced costs for land and or services. McKellar – the tax rates for Industrial and Commercial properties are essentially the same. The overall McKellar Industrial Tax Rate is the lowest in the area with the exception of Archipelago, which isn’t part of the amalgamation scenario and obviously offers many fewer amenities. Parry Sound – the tax rates for Commercial is among the lowest in relation to the Residential Property Tax Rates at 2.0x. The Industrial Tax Rate is the lowest at 1.8 times the Residential Property Tax Rate. Given that the Parry Sound tax rates are so much higher than all the other municipalities this lower premium is of no real competitive significance. The Commercial Rate for Parry Sound is almost three times that of Carling and Seguin and twice that of McDougall. This may help explain the apparent interest of businesses to establish a commercial presence in Seguin on the outskirts of Parry Sound. A $1 million property would pay on average about $10,000 less in property and education taxes annually and still be within walking distance of the south end big box centres. With respect to Industrial Tax Rates, Parry Sound actually has a tax rate comparable to that of McDougall and an overall property and education tax rate about 25% higher than the other municipalities, with the exception of Archipelago. This may explain some of the attraction of industrial businesses to locate in Parry Sound if they require certain services. A $1 million assessment would only cost $5,000 per year more in Property and Education Taxes in Parry Sound relative to other municipalities. Seguin – with the lowest Residential Tax Rates in the area, excepting Archipelago, it either is seemingly discouraging industrial development with its much higher taxes on industrial properties (4x Residential Tax Rates), or attempting to have these businesses take some of the tax load off of residential property owners. So, how much Property Tax do the various municipalities collect as a function of the population they serve; their residents? In the case of Parry Sound the town actually ‘serves’ more people than the official population but that is a point not everyone would agree with, so I will raise it and let it rest in the same sentence. Note: Numbers in this table are taken from Table 1 in Part 1 of this series. Sources and explanations can be found there. 1. “Population and Dwelling Count Highlight Tables, 2016 Census”. Statistics Canada. February 8, 2017. From Wikipedia (https://en.wikipedia.org/wiki/List_of_municipalities_in_Ontario) sourced 2019-03-04. 2. Calculated by dividing Property Tax Collected by Population. There are some major differences in the tax collected by the various municipalities. On the low-end Parry Sound and McDougall collect about $1,500 in Property Taxes per resident to provide the necessary services. That figure increases by 70% when you get to McKellar’s and Seguin’s $2,700 per resident. There is then a large jump up to Carling’s $5,500 followed by a hop, skip and jump to reach Archipelago’s almost $21,000. In some cases the differences can be accounted for the size of these municipalities and the relative lack of efficiency related to size. You still need one mayor, one CAO and so on to service a population of 1,100 or 6,000. You may pay these folks a bit less, but not one-sixth of the amount in Seguin or Parry Sound. That type of basic service cost does impact the smaller municipalities budgets. Another reason may be related to seasonal residents, the cottagers. These people still require services that aren’t accounted for in the official population count and obviously skew the per capita cost figures. Attention though should be paid to where a municipality with a considerable seasonal population under invests in a particular budget area as calculated using the permanent resident basis (Table 3). Assigning seasonal residents a one half or one quarter equivalent weighting would certainly change the results. I may do that type of analysis in a separate post. I can imagine the results but have not yet run the numbers. What is obvious is the efficiency with which Parry Sound and McDougall are operated and the benefits of urbanization. For all of the grief that Parry Sound receives for its higher taxes it seems to put its tax revenues to good work whether by keeping expenses low or capturing revenue other than through property taxes. I regularly shake my head when people outside the Town of Parry Sound suggest that the Town is not properly managing its budget and that this is the cause of its higher taxes. Enough of these numbers, let’s take a look at how the municipalities spend their money. It’s possible to look at the financial statements for the municipalities and get an idea of how their spending compares on some common line expenses. It’s not possible to compare their total budgets because in a number of cases Parry Sound collects and books revenues and expenses for the municipalities. This is the case of EMS and POA court costs. There are other line item expenses that are more directly comparable and are presented below. Estimated values for McDougall. 2017 Financial Statements not posted as of 2019-03-04. It’s possible that the McDougall figures are low on the Protection to Persons / Property expense line. Transportation Services sees the municipalities spending similarly high amounts on a per resident basis to keep the roads patched and cleared in the winter. Parry Sound and McDougall being more urbanized see some savings in this area. Planning and Development expenses are pretty similar except for McDougall. Perhaps there is some overlap in responsibilities in McDougall, or there is no particular investment in this area. Protection to Persons / Property is mostly similar on a per resident basis. This is a little surprising as the McKellar and Seguin have significant seasonal populations and high-end properties that require both police and fire protection. McDougall may be unreasonably low in this category because OPP rates were revised in the last couple of years and McDougall’s financial statements are not available online as of this posting. General Government sees Carling and McKellar on the high side on a per resident basis. This may well be a function of a relatively smaller resident population and the need to provide a full suite of services. Social and Family Services finds Parry Sound on the very low end of this expense on a per resident basis. This is largely due to the fact that these services are charged on a weighted assessment basis, not on population. Combined with Parry Sound’s larger population the per resident expense is low. This is offset is to a large extent by the many religious, cultural and social services located in Parry Sound that use Town services but are not subject to property taxes. Recreational and Cultural Services are the opposite with respect to Parry Sound where it spends almost five times what McDougall does on a per resident basis. Why spend the money if Parry Sound is a five minute drive away? McKellar and Carling spend more in this area but still only half of what Parry Sound does. Seguin with its many community hubs and public facilities falls only a little short of Parry Sound on a per resident basis. General Government: in the case of Parry Sound the expenses include a number of unique services including POA Court that make the figures hard to compare at a top line level. In many cases these figures are offset by cost sharing or revenues. Protection to Persons / Property: this is largely a combination of OPP and Fire Department costs. Because Parry Sound is home to the area hospital, a number of government buildings and high-rise residences it is obliged to have more substantial fire management equipment. The last ladder truck was more than $1 million. OPP services are also higher because of the out of towners that come into Parry Sound and shoot the place up (kidding!). But if a Carling resident comes to Parry Sound and robs a local store or is caught buying or selling drugs that cost is borne by Parry Sound. I am not familiar with the Seguin budget and can only suggest the reasons for the higher costs are similar with the exception of the need to protect high rise developments, hospital and government and social service facilities. Social and Family Services: here we see Seguin carrying the larger load. This is the result of the cruel requirement, at least in the opinion of some in Seguin, that the Belvedere Heights expenses are apportioned on the basis of Weighted Assessment. That also explains the higher expenses paid by Carling. Here is one case where the seasonal residents are shouldering more of the load for the larger area and not just their slice of heaven. Recreational and Cultural Services: this is one area where the municipalities have some ability to make decisions on what is important. In the case of Parry Sound, the Bobby Orr Community Centre, the Waterfront, numerous parks, and the Stockey Centre represent a major portion of the expense. In the case of Seguin, the community maintains a number of community centres spread over the township. I believe that Parry Sound has done its part in this area and would be looking to the other municipalities to shoulder a larger portion of any costs for an aquatic centre. Even when apportioned for population Parry Sound is far ahead of area municipalities in providing community recreation and cultural services. Planning and Development; the only outlier here seems to be McDougall. I’m not sure if they don’t believe in active planning or the expense is budgeted under another line item. Looking a little closer it’s half of Carling’s and McKellar’s expenditures so perhaps it reflects the longer-range investment in their futures. That’s more than enough for now. I was hoping to discuss the Muskoka tax rates as a model for how an urban, rural and seasonal residence community handles the obvious differences in service levels. You wouldn’t expect to have access water and sewer services on a lake in the backwoods of Muskoka. That’s where I will head with the next post. This series of posts was stimulated by a question posed by friends of ours in McDougall during a dinner discussion. The host asked me why it would be in the interest of McDougall residents to consider amalgamation. My immediate response was that it wouldn’t be. Amalgamation I imagined would lead to a property tax increase of about 10-20% for McDougall residents. But that was a wild assed guess. I have not seen any numbers on how amalgamation might impact the various municipalities. It is generally understood that amalgamation would benefit Town of Parry Sound residents but not the residents of the other municipalities. But there are no detailed numbers to look at. I wondered if I could do a rough pro forma estimate of the impact of amalgamation on property taxes based on the publicly available data. It turned out that I can, without too much difficulty. The results are surprising. But as my wife would say, why get to the conclusion when there is a good story to tell. In this case I will present some of the background related to local municipal taxes. It really is hard to properly understand how amalgamation will impact the various municipalities without understanding where they are now in terms of tax rates and expenses. Warning: if you don’t aren’t comfortable with numbers don’t venture further. There are lots of numbers and assumptions. Wait until the next post where there will be fewer numbers and some interpretation of what the numbers suggest. The analysis of amalgamation tax rates includes: the Town of Parry Sound (Parry Sound), the Municipality of McDougall (McDougall), the Township of Seguin (Seguin), the Township of Carling (Carling) and the Township of McKellar (McKellar). The Township of the Archipelago (Archipelago) is not included. As a municipality the Archipelago is quite different than the five listed above. I also figure that they have enough old money in the municipality to wield an unreasonable amount of influence in Queen’s Park. Our local MPP has already gone on record as not supporting the Archipelago being part of any amalgamation. I have also not included the Township of Whitestone or the Township of McMurrich/Monteith because they are not only quite distant, but have better things to worry about. The tax rates used in this analysis are based on published 2017 figures. While the 2018 tax rates are public, the corresponding financial statements for the various municipalities are not yet available. Using 2017 as a basis provides relevant figures. For the most part tax rates have only increased a couple of percent in each of the municipalities. The assessment values for the various municipalities are Weighted Assessments. These are figures that are publicly disclosed, although not easy to find, and are based on 2017 values. From a tax rate calculation perspective the most important figure to consider is the Property Taxes collected by each of the municipalities. This is not the same figure as the budget figure for total revenue/expenses. The total revenue figure is the sum of property taxes collected plus grants (Provincial, Federal and other) plus revenues from charged services (building permits, water services and other). A municipality totes up all of the revenue it expects to receive from all sources other than Property Taxes and calculates the shortfall in revenue versus expenses. For example, the total municipality budget might be $18 million with $10 million coming from Grants, Charged Services and Other. That means the $8 million shortfall is collected from residents as Property Tax. This Property Tax is then assessed to property owners on the basis of the property assessed value and the tax rate. Each municipality has a variety of tax rates by property class. Residential property enjoys a lower tax rate for the same assessed property value than commercial or industrial properties. In total then the tax rate is adjusted in each municipality to bring in the needed revenue. In the example above this would amount to $8 million. This is why the Province’s cut in municipal grants has a major impact on tax rates. Any reduction in these grants obliges a municipality to either raise the Tax Rate, reduce expenses, or take on debt, to address the shortfall. A note about assessed property values. Property values are assessed by MPAC according to metrics that are supposed to be common for all municipalities in the province. A property with a 5,000 square foot home, two acres of land and 500 feet of waterfront should have the same general assessed value whether it is in the Archipelago, Seguin or on Lake Simcoe. There may be additional factors to consider but the idea is that there should be parity in property values based on inherent value of the property. This is important when setting tax rates. In the past it was possible for municipalities to play with both property assessments and tax rates. Currently municipalities have no control over what properties are valued at and can only adjust tax rates to meet their budget needs. This is particularly important for district type expenses, for example education and social services. These services are generally charged at the same rate, regardless of municipal tax rates, in each municipality based on MPAC assessed values. That means the Town of Parry Sound and Seguin and McKellar all have the same education tax rate for residential properties. There is however some difference in the tax rate according to class of property, for example residential, commercial and industrial. These numbers are shared in the analysis for the purpose of completeness. This section is divided into three sections. Section One provides a summary of the 2017 Tax Rates for each of the municipalities. While there are a number of tax rate categories only the three most relevant categories are included. The full rates for each municipality can be easily found online. This section also provides the Education rates for each of the municipalities. This is relevant for the the third section where pro forma taxes by property value are presented for each of the municipalities. Tax Rates for the Archipelago are included for the purpose of comparison even though this municipality is not being considered in the standard amalgamation scenario. Section Two summarizes the Weighted Assessments for each of the municipalities. Information on the Assessments by tax category is not readily available. Section Three summarizes sample taxes for a variety of different property values for each of the municipalities and residential, commercial and industrial properties. Table 1 provides a summary of the tax rates by municipality and includes Property Tax and Education Tax Rates. The effective tax rates were calculated by dividing the Property Tax collected by the total weighted assessments for each municipality. This total does not include Education Taxes. The tables below provide a summary of sample Property Tax, Education Tax and Total taxes for properties in the municipalities. A selected number of assessments have been chosen for the sake of simpleness. Calculating other values is as simple as multiplying one of the defined figures by the appropriate factor. For example, a $200,000 assessment in Carling would have a Total Tax of $1,232 ((200,000/25000) x $1,540). Property and Education Taxes unlike income taxes are not progressive. The values chosen reflect a variety of real world assessment values. While there are no $1 million or $5 million residential properties in Parry Sound there are commercial and industrial properties with valuations on this order. In contrast there are a limited number of commercial properties with these valuations in McDougall, Seguin and Carling, but there certainly are numerous residential properties. As promised, there are lots of numbers. Getting a handle on these figures, which represent the current taxation situation, is critical to understanding where taxes and tax rates might head in the case of amalgamation. The next post will provide some comments on the numbers presented in this post regarding the apparent similarities and differences in taxation approaches taken by the municipalities. The next post will also take a look brief look at Muskoka and what types of ‘flexibility’ there might be with regards to amalgamation taxes. This coming week sees a rather full meeting agenda for Town of Parry Sound Council. The notable items are briefly commented upon below. The agenda itself follows. Closed Session b) – proposed or pending acquisition or disposition of land by the municipality or local board: (property appraisal). I wonder if this has anything to do with the property the Town purchased from the Province on Oastler Park Drive across from the Canadian Tire building. Closed Session c) – labour relations or employee negotiations: (CAO employment agreement workplan).Hmmm! 9.3.1– Council Members 1/3 Tax Exemption. Councillor and Mayor remuneration is proposed to increase along with their benefits. The annual cost to the Town is about $35,000. 10.2.2- Site Plan Development Agreement with Infrastructure Ontario (OPP Station – 1 North Road). It looks as though the OPP facility move is ‘moving’ forward. That should mean a little less traffic in Town and ultimately the availability of prime waterfront real estate for development. A map showing the location of the new facility is included at the end of this post. As always, refer to the full Council Agenda Package at the Town’s website for all included materials. The full package this week is 94 pages. Heads Up – I have crunched the numbers on what amalgamation would likely mean for individual municipality tax rates. I’ll roll out the analysis in series of posts starting early this coming week. 4.3– Marsha Rivers, CEO, Belvedere Heights. 2019 Municipal Levy for Belvedere Heights. 4.4– Rebecca Pollock, Chair, Parry Sound Active Transportation. Request to allocate in the 2019 budget, monies to determine the feasibility of applying the road diet concept to Parry Sound’s arterial roads, including any necessary engineering and planning reviews. 4.5– Leah Harris, Town resident. Request that after-hours water service bills to shut off water be removed from their account. 4.6– Municipality of Neebing. Request for resolution of support to appeal to both AMO and ROMA to split Zone 9 into 2 geographical districts; and to ROMA, to limit the vote to one per municipality at its annual general meeting election for zone representation. Therefore, be it resolved that Council of the Town of Parry Sound hereby acknowledges receipt of the report titled: “Town of Parry Sound Tony Agnello Water Treatment Plant, Large Municipal Residential Drinking Water System Summary Report 2018”, as prepared by Kyle Hall, Manager of Water Systems. 3. Haul and apply biosolids on licenced disposal sites. This proposal being the lowest of two proposals received. 9.1.3– 2019 Great Lakes and St. Lawrence Cities Initiatives Annual Conference. Resolution. That pursuant to By-law 2002-4549 which requires prior Council approval for attendance at seminars, conferences and conventions outside the Province of Ontario; Council authorizes the Director of Public Works to attend the 2019 Great Lakes and St. Lawrence Cities Initiatives Annual Conference to be held in Sheboygan, Wisconsin, June 5 – 7, 2019. 9.2.1– Revision to 2018 Land Ambulance Budget. Resolution. That the Council of the Town of Parry Sound approve the revised 2018 Land Ambulance Budget that includes an additional $309,357 incurred for higher than normal sick time occurring in the 2018 fiscal year. 9.3.1– Council Members 1/3 Tax Exemption. Direction. That staff be directed to implement remuneration increases of elected officials retroactive to January 1, 2019, as recommended in this report and consistent with Council direction as set-out in By-law 2015 – 6554. Direction for Staff Follow-up: That upon approval of Council direction regarding: remuneration increases retroactive to January 1, 2019; and consideration of Council group benefits (health, dental); staff present a comprehensive compensation by-law for Council members to a future Council meeting. Whereas lengthy processing times are a challenge in Northern Ontario where construction seasons are shorter due to the climate and various environmental restrictions at certain times of the year; and Whereas, in some cases, lengthy approvals result in losing out on investment opportunities and applicants abandoning their applications and their plans to locate in Northern Ontario; and Whereas these delays adversely affect the objectives of the Program. Now therefore be it resolved that the Town of Parry Sound supports the Provincial Government’s focus on how to cut government red tape, improve government programs and services; and That NOHFC Business Expansion and New Investment funding application procedures and processing times should be reviewed with the objective of reducing approval timelines to 6 months or less. That NOHFC expedite the application process by retaining more than one audit firm to undertake the auditing of the applications. That a copy of this resolution be forwarded to: the Honourable Vic Fedeli, MPP, Minister of Finance; the Honourable Greg Rickford, MPP, Minister of Energy, Northern Development and Mines/Minister of Indigenous Affairs; Mr. Norman Miller, MPP, Parry Sound – Muskoka. 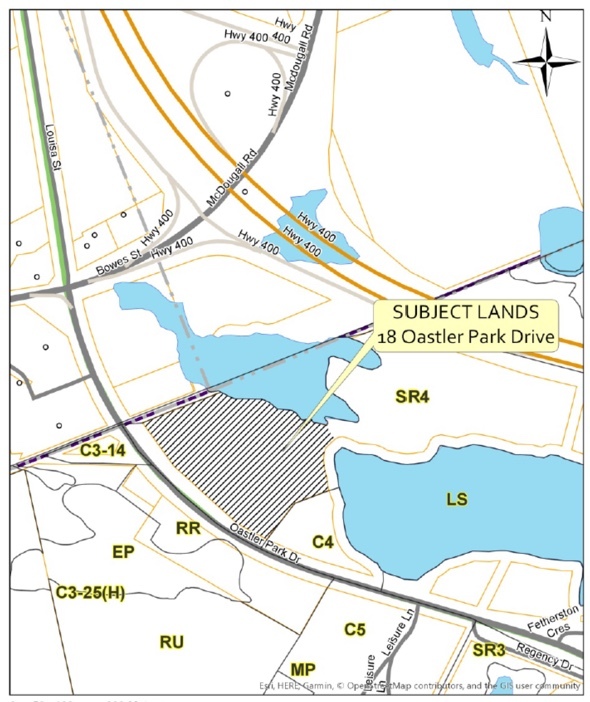 9.5.1– “Right to Approve” Landfill Developments. Resolution. AND THAT the MOTION adopted by Council be forwarded to the DEMAND THE RIGHT COALITION OF ONTARIO MUNICIPALITIES. 10.2.1– Appointment of Will Williamson as a Building Inspector. By-law 2019-6898. Being a By-law to appoint Will Williamson as a Building Inspector for the Town of Parry Sound. 10.2.2– Site Plan Development Agreement with Infrastructure Ontario (OPP Station – 1 North Road). By-law 2019-6899. 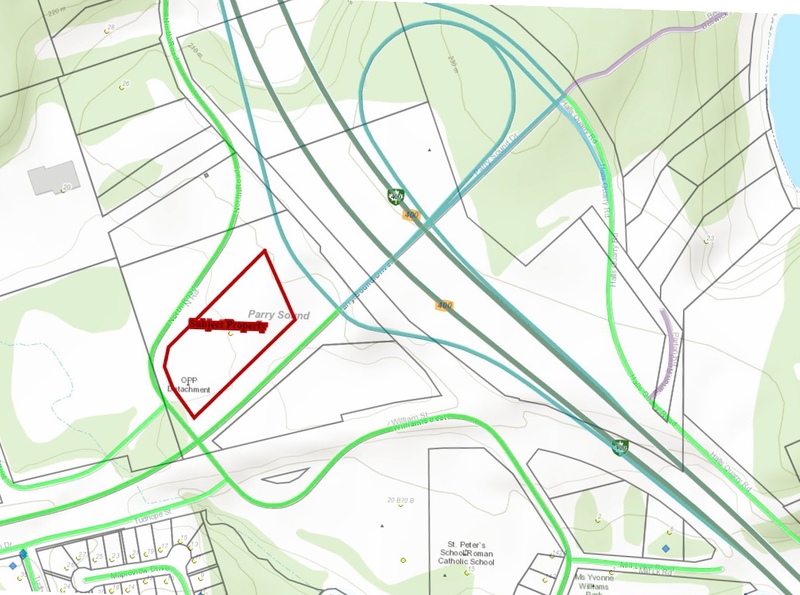 Being a By-law to authorize a Site Plan / Development Agreement with Infrastructure Ontario (OPP Station – 1 North Road). I want my 2019 Draft Budget (to the tune of I want my MTV). I can empathize with the Town’s challenges with regards to their Finance Director, but that is where senior management is supposed roll up their sleeves and get it done. Stuff happens but we still get the roads plowed, if not in the next hour or two, at least in the next six hours. Even the Director of Operations will get behind the wheel if necessary. I am concerned that we will have a budget administered to us without any public review and input. I am usually sympathetic to the challenges of running any type of operation but this is starting to have overtones of negligence. There really is nothing of importance on the agenda. The finance folks are investing time in making sure that members of Council are properly topped up with respect to salaries (Item 9.3.1). Council and Staff are spending time on telling our neighbours what they would, and would not, like them to do with the zoning of their properties (Item 9.2.1). It’s a bit like asking your neighbour for input on an in ground swimming pool you are planning to have installed and they say they would rather you didn’t. What are you going to do? We finally get a report from the Economic Development Officer (Item 9.3.3). Council and Community Member remunerations are reported (Item 9.4.1). I have pasted the most relevant tables from that section at the end of this Council Agenda Preview. One last thought: Where is the draft 2019 budget? b) personal matters about an identifiable individual, including municipal or local board employees (Planning Matter); (Board Appointments). 4.1– Marion Cross. Recycling Policy at BOCC. 4.2– Georgian Bay Forever. Requesting partnership support regarding Divert & Capture Program: The Fight to Keep Microplastics out of our Water. 4.3– Chris Cardy. Rotary Splash Pad Positive supporters advocacy to install Splash Pad. 4.4– Anna May Gillingham. Concerns about sidewalk conditions on William Street. 5.1– Mayor Ted Comiskey, Town of Ingersoll. Ontario Municipalities Demand of “Right to Approve” Landfill Sites in jurisdiction. 5.2– Christina Bossart, Ian Sproule. Hidden Bay March Break Camp. 6. The Township of Seguin provide a notice of decision to the Clerk of the Town of Parry Sound. Direction. That staff bring Council group benefits options (health/dental) for consideration to a future Council meeting. Direction. That upon approval of Council direction regarding: remuneration increases retroactive to January 1, 2019; and consideration of Council group benefits (health, dental); staff present a comprehensive compensation by-law for Council members to a future Council meeting. 9.3.2– Bobby Orr Gift Shop Renovation. Resolution. THAT the Bobby Orr Hall of Fame gift shop renovation budget of $50,000 be approved; and the required funds be withdrawn from the Bobby Orr Hall of Fame Special Projects Reserve Fund. 9.3.3– Economic Development Report. Presentation for Council Information. 9.4.1– 2018 Statement of Remuneration to Council and Board Members. Resolution. That the 2018 Statement of Remuneration Paid to Council and Appointed Board Members, attached as Schedule “A”, be accepted. 10.4.1– Debenture By-law. By-law 2019 – 6896. Being a By-law to Authorize the Borrowing Upon Amortizing Debentures in the Principal Amount of $4,585,451.59 Towards the Cost of the Reconstruction of William Street with Drainage Improvements, and Reconstruction of Emily St. This week’s council meeting has a number of Closed Session items that are worth noting. I’m most interested in the whole issue of “Claim Against the Municipality Regarding 2018 Municipal Election”. Oh boy. This is the same person who suggested that a high-rise development in town should not be approved because there were not enough fire department resources to handle a fire at this new development and one of the existing higher rise developments. OMG – what if we had a fire at all four of the high-rises at Silver Birch, the three high-rises at granite Harbour and the hospital. Oh, and don’t forget the old hospital development. Would one more complex really raise the threat level? Sheesh. I note the continuing interest and complaints regarding the proposed Splash Pad (4.1, 4.2). My suspicion is that some folks are concerned that a splash pad at Waubuno Beach would delay any potential pool complex. So, putting a stop to the splash pad would be good for a pool complex. It’s a bit Trumpian. The suggestion that the splash pad be constructed at another site makes no sense. There are no other public properties in Parry Sound that have the necessary existing space, parking, supervisory staff (lifeguards) and infrastructure (bathrooms and such) to support a splash pad. Only a pool complex would have the necessary infrastructure if Waubuno Beach can be knocked out. If Waubuno Beach is eliminated, and you really want a splash pad, then you need to support the pool complex. I wonder how many of the people chiming in on the splash pad discussion have really spent time in the public spaces in Parry Sound to realize what alternate options exist. If they had they would recognize there is no real alternative. And if they really want a quiet place to live without the ‘bother’ of visitors and tourists they should move to one of the area municipalities. They could be on a lake, or the bay, and enjoy lower taxes. There is a resolution before Council (9.2.1) to opt-in and permit cannabis stores in the Town of Parry Sound. Item 9.2.2 raises a point that has come up before. The Town’s effective subsidizing of regional community social services by hosting a number of tax-exempt resources (public housing, places of worship, social services …) creates a burden on Town services and by extension a financial burden on Town of Parry Sound taxpayers. This resolution acknowledges and accepts the Town’s responsibilities but requests that it be able to more easily address the unreasonable burdens placed upon it by existing legislation. 4.2 – Colleen O’Hare. Opposition to splashpad at proposed Waubuno Beach location. 4.3 – J. Hinchliffe. State of property after infrastructure work on 40 Waubeek Street easement. 4.4 – Harald Themer. Request for formal permission to use area at 60 Seguin Street for parking. 5.1 – Darrin O’Brien, Gord Harrison. Appeal of municipal taxation on 86 Gibson St.
5.3 – Ruth Beattie, Nancy Regan, Parry Sound High School Parent Council. Recommended amendments to provincial guidelines governing retail cannabis stores. 9.2.1 – Opt-in to permit Cannabis Retail Stores. Resolution. That Council for the Corporation of The Town of Parry Sound opts-in to permit cannabis retail stores in its community. Whereas the Municipal Property Assessment Corporation (MPAC) has determined this provision has been applied to certain affordable housing initiatives in Ontario and resulted in a 100% tax exemption for some of these developments; and Whereas these developments still place a demand on municipal services and their tax relief must therefore be recouped from other property owners, resulting in increased taxation; and Whereas this Section of the Assessment Act will adversely impact the goals contained in the Increasing Housing Supply in Ontario consultation document, by creating a negative stigma towards affordable housing and a reluctance to support future affordable housing projects; and Whereas it is very difficult to monitor an exempt development over time to determine if the development has changed its mandate or operations such that it would no longer qualify for the exemption; and Whereas an appeal of MPAC’s decision to exempt a property cannot be appealed to the Assessment Review Board but must be done through a Court Application which can be time consuming and costly. Now therefore be it resolved that the Town of Parry Sound supports increasing the overall housing supply and supports affordable housing projects; and That Section 3(1)12iii. of the Assessment Act which places an unfair tax burden upon municipalities, should be amended such that the local municipality that bears the financial burden should be permitted flexibility and the ability to determine the extent of any financial relief provided in their community; and further That a copy of this resolution be forwarded to the Honourable Steve Clark, MPP, Minister of Municipal Affairs and Housing, Mr. Norman Miller, MPP, Parry Sound – Muskoka, the Director of the Market Housing Branch of the Ministry of Municipal Affairs and Housing, and the Association of Municipalities of Ontario (AMO). 9.2.3 – EMS Ambulance Replacements for 2019. Resolution. That upon the recommendation of the EMS Advisory Committee, the Town of Parry Sound approves the replacement of three ambulances to be delivered in late winter 2019; and That the supplier of record, Crestline, be awarded the contract for the supply of these three ambulances in the amount of $126,578.78 + HST each, with funding from the 2019 EMS equipment reserve fund; and That the upon delivery of the 2019 ambulances, the three being replaced be deemed surplus with two of them being donated to the First Response Teams in McKellar and Argyle, and the third being traded into Crestline for the sum of $10,000.00. 10.3.1 Downtown Business Association/Town of Parry Sound Memorandum of Understanding: Downtown Standard of Care. By-law 2019-6888. Being a By-law to authorize the execution of a Memorandum of Understanding between the Corporation of the Town of Parry Sound and the Parry Sound Downtown Business Association for Downtown Standard of Care, and to repeal By-law No: 2017-6783. I initially thought that the meeting on the 18thwould simply be a public meeting to get public opinion on the retail cannabis stores but it seems to be a full meeting of Council. I provided my written comments to the Town regarding the retail cannabis store issue a month ago. I support the establishment of a cannabis retail store presence in Parry Sound. It seems that it will be some time before Parry Sound might see a commercial presence based on a recent announcement that the Province intends to start with only 25 retail stores. I suspect that Parry Sound won’t be among the twenty-five. The local cannabis black market will be secure for at least another year or two. The other notable issue that seems to be getting people’s knickers in a twist is the issue of a splashpad. I’ll share my thoughts on this later in the week after I’ve had a chance to hear arguments on the issue at Tuesday’s deputation portion of the council meeting. An abridged version of the agenda is presented below. Refer to the full agenda package at the Town’s website for a complete agenda with the supporting documentation. 2.1.1 Public Consultation on Permitting Cannabis Retail Stores in Parry Sound. 4.1 – Julia Mader, Keep Waubuno Green. Request that an alternative location to the Waubuno Beach Park be considered for the proposed splash pad. 4.2 – Colleen Moore, Parry Sound resident. Opposition to proposed splash pad and request to support pool instead. 4.3 – Peter Scotland, Parry Air H.T.G. Parking by-laws in place at lower end of James Street. 4.4 – Jim Marshall, Chair, West Parry Sound District Museum. Request for 2019 contribution of $31,800 from the Town of Parry Sound. 4.5 – Susan Hrycyna, DBA Executive Administrator. Appointment of Directors for term 2019-2022. 5.1 – Julia Mader, Keep Waubuno Green. Request that an alternative location to the Waubuno Beach Park be considered for the proposed splash pad. 5.2 – Peter Scotland, Parry Air H.T.G. Parking by-laws in place at lower end of James Street. 9.2.1 – 2019 Land Ambulance Budget. Resolution. That upon recommendation of the EMS Advisory Committee, the Council of the Town of Parry Sound adopts the 2019 Land Ambulance Budget in the amount of $9,734,405.00. 9.3.1 – Recognizing Employer Support of our Volunteer Firefighters. Direction. That Mayor and Council send a letter of appreciation to those employers that permit their employees to respond to emergency calls during work and to those who are self-employed. 9.3.2 – Support the Creation of a Founders Circle in Parry Sound. Resolution. That Council hereby supports the Parry Sound Muskoka Community Networks (PMCN) initiative to create a Founders Circle in Parry Sound by the Town becoming a member at a cost of $1,000 annually. 9.4.1 – General Insurance Renewal and Cyber Insurance. Resolution. That Council hereby approves the renewal of the Corporation’s general insurance policy with BFL Canada at the premium of $283,050 plus tax for the one-year period ending December 15, 2019; and That Council hereby approves the purchase of a cyber insurance policy from BFL Canada at the premium of $12,494.00 for the period from the policy inception date to December 15, 2019. 9.5.1 – Status Update on the Parry Sound Area Cultural and Recreation Master Plan. Direction. That staff be directed to provide a status update on the Parry Sound Area Cultural and Recreation Master Plan as part of upcoming budget deliberations, for consideration of 2019 budget allocation for a revised or new Parry Sound Parks, Recreation and Culture Master Plan. 10.4.1 – 2019 Interim Tax Levy. By-law 2018 – 6886. Being a By-Law to provide for an interim tax levy, for the payment of taxes, and for penalty and interest at 1 1/4 percent per month for the 2019 taxation year.